Wedding video package prices in Rockford & Northern Illinois. We are priced fairly, with no bells and whistles. It's one of the biggest days of your life. Make sure it's captured perfectly. I'd like more than 8 hours coverage. Can I add more hours to my wedding video package? Yes! Each additional hour is simply $100 per hour. Yes! Most weddings we film are within an hour of Rockford, IL. But we are always willing to travel beyond that (we do charge a small mileage fee to cover transportation costs if the wedding is outside of Rockford). Get in touch with us and let's see if we're a good fit. What is a 'full-length edit'? We offer this in our premium package and it is basically an edited version of everything that we capture during the day. 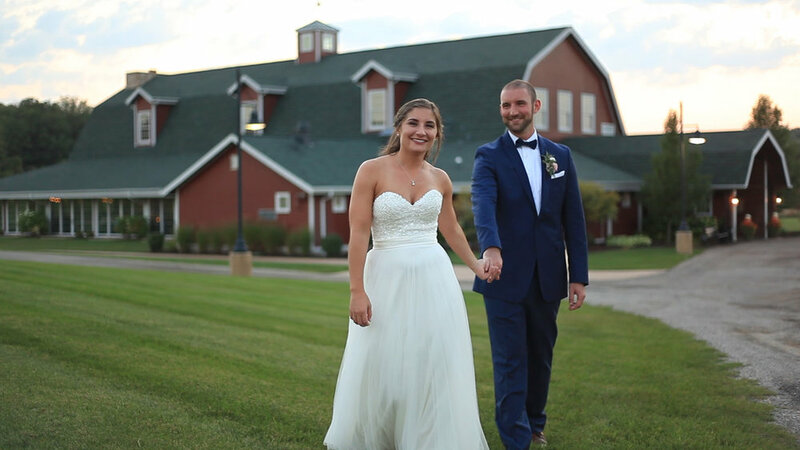 This edit of your video usually lasts 1-2 hours and includes 5-10 minutes of "getting ready" footage/bridal prep, full playback of the ceremony, speeches & dances at the reception, and anything else happening during your big day! When can I expect to receive my wedding film? We usually try to deliver highlight films within 1-2 months after the wedding. For full-length edits, typical turnaround times are 4-5 months. Features a short story of the bride and groom’s life as told by parents/bridal party in short individual interviews. These interviews will be interwoven with music and clips from your wedding day as well as materials from throughout the bride and groom’s relationship (as provided.) Video concludes with a message/interview from bride to groom and vice versa.